I have set the LORD always before me. Because He is at my right hand, I will not be shaken (Psalm 16:8, NIV). Susan lived “the good life.” One filled with prosperity and love. For years, she and her husband owned a thriving business that allowed them and their children to be surrounded with beautiful material things. They had a glorious lake home, a lavish boat, and luxury cars. Everything the world counts as gain. In spite of their earthly wealth, when faced with the truth of the Gospel, Susan and her husband realized that they were spiritually bankrupt and in desperate need of a Savior. Within months of each other, Susan and her husband both accepted Christ and began to thrive in newly found faith. A few years into faith, Susan was squeezed by difficult circumstances. The family business took a turn for the worse and had to close its doors – leaving many friends and employees jobless. Then the IRS audited her husband. Scary legal ramifications threatened to crush them if large amounts of money were not paid to accommodate accounting debt. Financially ruined and emotionally stunned, Susan and her husband were forced to sell all that they owned. Years later, they still waded through the deep waters of financial strain. Their debts were far from being forgiven and the economy had grown progressively dim. Through the turmoil, Susan learned to trust in God as her Provider. As she trusted Him, God faithfully filled her with supernatural peace, strength, and joy. She experienced God’s provision through His Word, through His presence, and through her friends. When her pantry had been empty, God knew. He sent friends to her home with bags of groceries and gift cards. When her soul had been discouraged, God knew. He sent reminders of His promises and love through Scripture and through the encouragement of godly women. Despite the fact that her bank account was still bare and the days were still complicated, Susan considered herself to be wealthier post-loss than ever because she knows the soul-level unshakable peace that is found in Jesus. As the time of His betrayal and crucifixion approached, Jesus told his disciples that though they would grieve His death, their grief would be turned to joy. He encouraged them to believe all that He said and gave them a compelling promise. “I have told you these things, so that in me you may have peace. In this world you will have trouble. But take heart! I have overcome the world” (John 16:33). He promised His bewildered disciples that, in Him, they would have peace in the midst of trouble. And how wonderful to know that His promise is valid for us too. No matter what you go through, you can experience unshakable peace, and declare, “I will not be shaken!” as the psalmist did in Psalm 16:8. God knows what you have been through and what you are going through. He promises peace to each believer through Jesus. Instead of finding ways to hold on to what you have, be encouraged today to let go. Let go of what doesn’t matter. Even let go of those things that seem worth your worry. Seek God first, friend … above and before any earthly thing, large or small. Have faith that He will meet you at your need. God wants us to store up treasures where moth and rust will not destroy. When we do, He promises that we can live with an unshakable peace that passes understanding. Dear Lord, I need your unshakable peace! Please forgive me for placing my trust and hope in things of this earth. Lead my soul to find rest in You and in Your perfect plan for my life. Read Psalm 16. Underline your favorite verses and consider committing them to memory. Are you ready to move forward in God’s unshakable faith today? Click here to visit my blog and leave a comment that says, “I need God’s unshakable faith!” or “I am re-directing my trust today!” Then have fun encouraging each other in the comments section. Today’s devotion is an excerpt written by Gwen Smith featured in the book Trusting God. 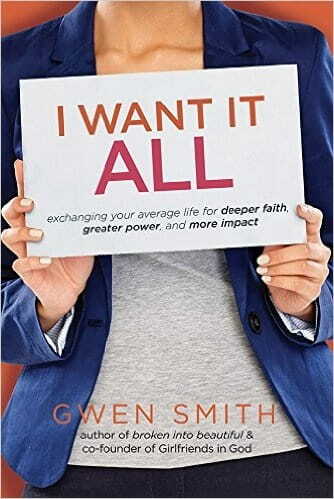 Ready to begin a fresh faith adventure today?Gwen Smith’s new book, I Want It ALL, gives you practical help to connect your struggles to the very real solutions of God found in His Word. Order yours today from Amazon, Barnes & Noble, ChristianBook.com or your favorite retailer.